Bands drawn in fine blue outlines; the widest band has linked palmettes set into heart-shapes, while two smaller bands show interlacing leaves and tendrils. Along a seam are the remains of two further bands with chevrons. 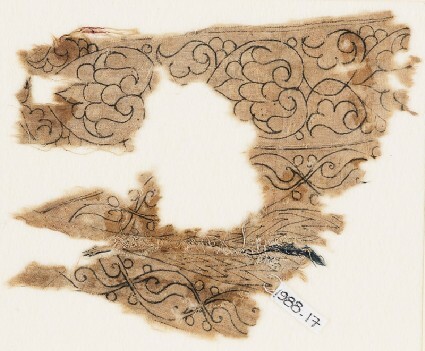 The run-and-fell seam sewn with fine flax thread also has the remains of a blue fragment.